Rockstar Energy Husqvarna Factory Racing rider Pablo Quintanilla has won the 2017 FIM Cross-Country Rallies World Championship at the final round of the series in Morocco. Successfully defending the title he won in 2016, the FR 450 Rally mounted rider wrapped up the 2017 OiLibya Morocco Rally with a top six result in the event’s final overall standings. 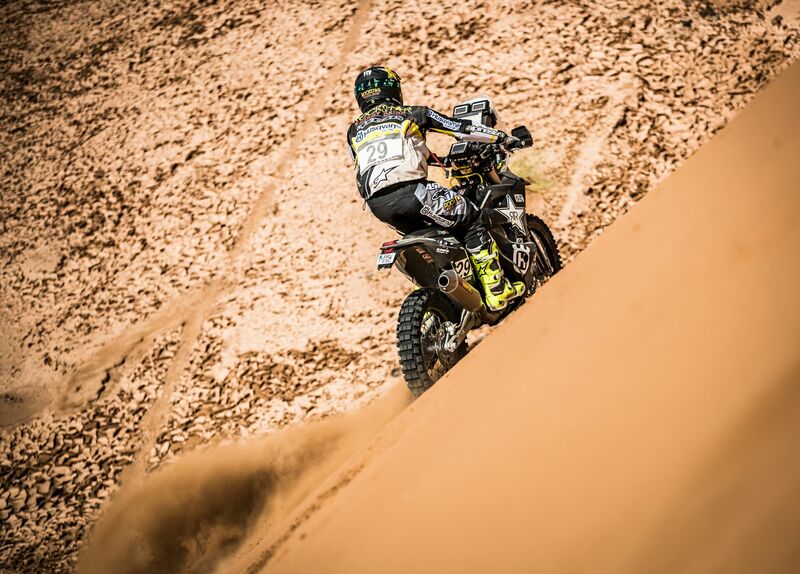 Putting in one more solid performance today in the dunes of Morocco, Pablo posted the fourth fastest time in the first 163km-long timed special stage to go on and finish the event with the sixth best time in the short final special. With race organisers opting to re-instate a 20-minute penalty handed to Pablo on day two, the Chilean rider wrapped up the 2017 Morocco Rally with sixth in the event’s final standings. Collecting the points needed to secure the 2017 FIM Cross-Country Rallies World Championship, Pablo has secured a second consecutive rally championship for the Rockstar Energy Husqvarna Factory Racing team. Moving up two spots in the event’s final standings, Rockstar Energy Husqvarna Factory Racing’s Andrew Short rounded out the 2017 Morocco Rally in 14th position. Putting in another steady performance today in the dunes of Africa, the former MX and SX star has made notable progress in his very first multi-stage international rally event. The Rockstar Energy Husqvarna Factory Racing rally squad will return to action in January 2018, with the 2018 edition of the prestigious Dakar Rally taking place in Peru, Bolivia and Argentina.